Piero’s Italian Restaurant & Pizzeria01277 353194work Restaurant - ItalianPiero’s Restaurant and Amico Lounge Bar is a family owned business run by Piero, Vincenzo and Maria Amico, who are originally from Villa Castelli, Puglia, situated on the heel of Italy. With many years experience as a chef, Piero ensures excellent standards and quality of food, sourcing himself all his fruit and vegetables from New Covent Garden and New Spitalfields and meat from Smithfield Market. Much of his produce, including flour, Italian meats and cheese comes from many different regions in Italy, allowing him to source the best possible merchandise. Vincenzo runs the stylish and contemporary lounge bar which has a fantastic ambience with weekly Live Music. 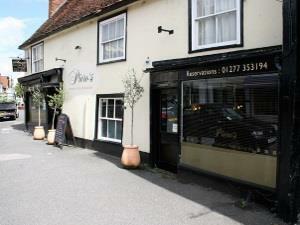 Maria’s domain is the restaurant; the reputation of which is rapidly spreading across Essex for its authentic Italian cuisine and warm, friendly atmosphere. Piero’s Restaurant and Amico Lounge Bar is a family owned business run by Piero, Vincenzo and Maria Amico, who are originally from Villa Castelli, Puglia, situated on the heel of Italy.